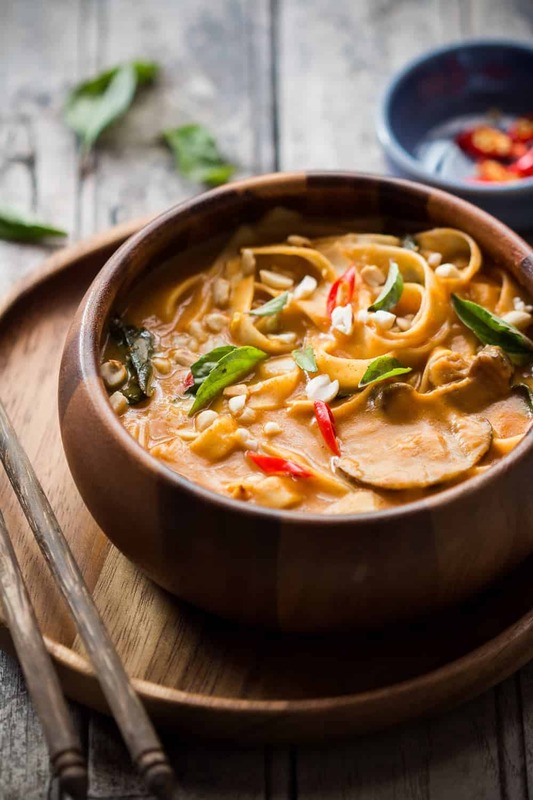 Because we love warm, creamy soups; all the flavours from Thailand and everything to do with noodles! And we are making the most of whatever’s left of the winter. Because temperatures in Bangalore are rising pretty fast, and there’s nothing we can do about it except bring out the ice cream! I still haven’t gotten over my trip to Bangkok because I keep craving the food. There is something about spicy food with lemongrass and galangal that is so irresistible. It’s perfect when you want comfort, or want to go fancy. And this thai curry pumpkin noodle soup really does both. It looks fancy enough to serve at a dinner party, but is comfortable enough to slurp away in your pyjamas with some dripping down your chin. I’m not going to pretend that this is super easy. Because you need pumpkin puree, which is really easy to make but does require some chopping and boiling = effort. I have the process noted below for all those who live in India and can’t buy ready made or canned pumpkin puree. Although, if you ask me, making your own is worth it and will help you take one more step towards eating healthy. It’s small changes like these, which make a big difference. 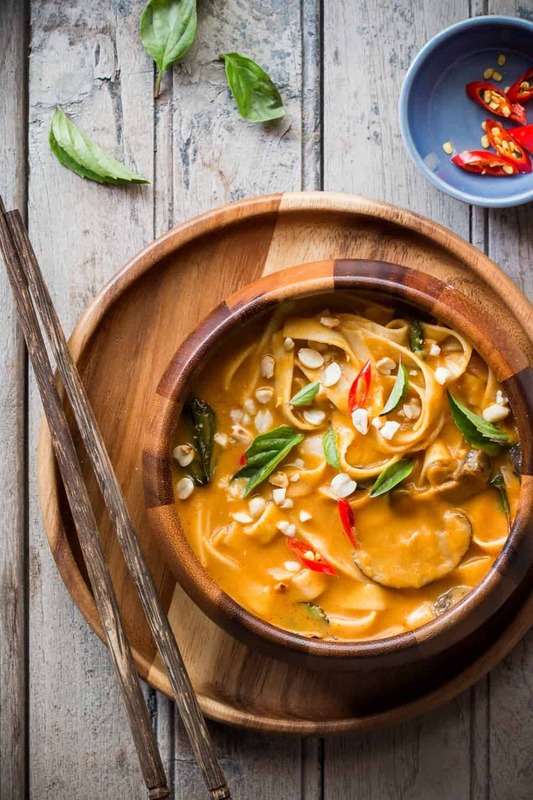 This thai curry pumpkin noodle soup is everything right now. Because it’s a meal in a pretend soup form. And I love options like these, because they make life so easy, eliminating the need to cook multiple things to make dinner seem balanced and hearty. Yay for one dish meals that give you more time to watch Netflix! And yay for more thai curry pumpkin noodle soup! If you try this out, tag your photos @my_foodstory and let’s be friends on Instagram. 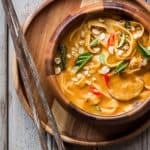 Creamy, comforting spicy thai curry pumpkin noodle soup gets ready in 20 minutes and the recipe takes you back to Thailand! Soak dried shiitake mushrooms in hot water for half an hour. Heat oil in a large pot and add thai red curry paste. Saute for 2-3 minutes and add pumpkin puree, fish sauce and 2 1/2 cups broth or water. Slice the shiitake mushrooms and add them to the pot along with jaggery and salt. Bring everything to a boil, and simmer for 8-10 minutes. In the meanwhile, boil noodles according to package instructions till al dente (cooked but still firm when bitten), strain, wash with cold water and set aside. Washing with cold water stops the cooking process and helps avoid sticky, overcooked noodles. Whisk together 1/2 cup broth with 3/4 cup coconut milk and add it to the pot around the 8 minute mark. Simmer for another 5 minutes. Add noodles and basil to the pot and switch off the flame. Cover and let the soup sit for 5-7 minutes before ladling it into bowls. Serve hot topped with crushed roasted peanuts and thai basil. Note 1: Feel free to substitute shiitake mushrooms with regular button mushrooms. In case you are using button mushrooms, skip the soaking process and directly add sliced mushrooms to the pot. Note 2: To make pumpkin puree, peel and slice a medium sized pumpkin and boil it in water till the pumpkin becomes soft and can be pricked easily with a fork. Drain, cool and puree till smooth. Note 3: If thai basil leaves are hard to find, use Italian basil or even tulsi (Indian basil) in it’s place. Adjust the quantities slightly if substituting. What kind of noodles do you use? I used flat rice noodles. They are called pad thai noodles on the box. This looks yummy. I’m going to make this week. I don’t care for mushrooms. Any suggestions on a substitute vegetable? Hey Ashley – you can use your favourites veggies – broccoli, french beans, sweet potato, squash would all work really well. The cooking time will vary though for things like sweet potato and squash which take longer to cook. I just made it- mmmmm! What a wonderful treat for a snowy day in Minnesota. Thank you! Glad you liked it Mj! Why does the print version make 10781 servings? Sorry thats just a technical error that we are trying to fix. You show a sliced red pepper in the photos, but one isn’t listed in the ingredients. Is that a mistake? If there is a pepper what kind please, there are many. Can I use canned pumpkin instead of buying a pumpkin and cooking it? this sounds so good! Loved this! I added some ginger, cayanne pepper, and used chicken broth because that’s all I had. It turned out great! Yay! So glad you enjoyed it – I love the additions you made to it. How much thai red curry paste is added? Sorry about missing that out – we added 2 tablespoons thai curry paste. I’ve also updated the recipe. Any particular kind of noodles? Thank you. I used flat rice noodles for this recipe, but you can use any kinds. Hope you try this out Laura! Thank you! I plan to make it this weekend. Wow these dishes look delicious !